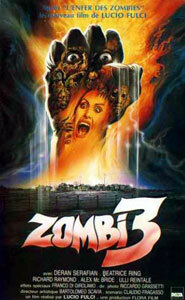 This was also released under the title Zombie Flesh Eaters 2. It is a super cheesy pastiche of other zombie flicks with scenes reminiscent of The Birds and The Crazies thrown into the mix. A bunch of scientists working for the military develop a serum called Death One that brings the dead back to life and after cremating an infected body the ashes spread the virus. A bunch of guys in white overalls and gas masks run around slaughtering everyone while a couple of soldiers battle them and protect a stupid woman who has a knack for getting everyone she meets killed. There are loads of daft gory scenes and the military idiots refuse to listen to the enraged scientist. This is messy and extremely silly with hammy acting and terrible dubbing.